As part of my masters research I have followed the development of the genre of encyclopedias. To do so I’ve read the prefaces of Chambers’ Cyclopedia, Diderot & d’Alembert’s Encyclopédie, the Encyclopedia Britannica, and Wikipedia. I presented my findings about how the editors of these encyclopedias imagined their authors and audiences at the Interface conference at the University of Ottawa in 2012. Below are three slides outlining the changing ideas of who wrote and read the genre. This timeline shows the duration of publication for four of the most influential encyclopedias in the genre. Missing from this graph is the Cyclopaedia’s second printing 1838. However, even with this second printing, the Cyclopaedia has the shortest publication period. Second is Wikipedia, but of course there is no indication of when it will stop being a relevant encyclopedia. Third is the Encyclopédie with almost two decades of editions. 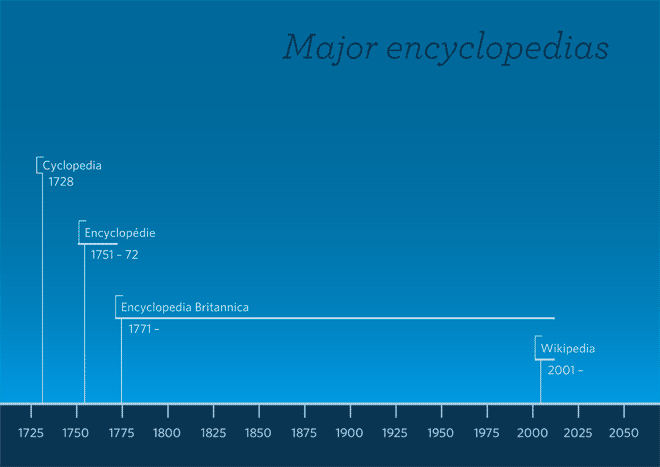 Finally, the most notable feature of the timeline is the length of time that the Britannica has been a relevant encyclopedia, for over two hundred years and counting. By reading the prefaces of each of these encyclopedias and what historians have to say about each, I’ve displayed what kinds of people have been thought to be considered encyclopedic authors. In the beginning it was the editors themselves and a reliance on repurposing the works of dead authors. Diderot & d’Alembert then introduced the idea of using volunteers to add breadth to their Encyclopédie. They also used anonymous contributors as well. 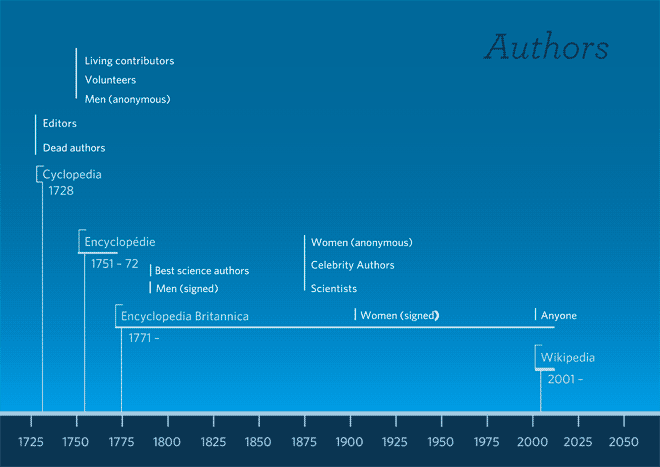 The Britannica introduced the idea of using well-known science and celebrity authors. The the Britannica has often been remarked upon for its prestigious contributors including T.H. Huxley, James Clerk Maxwell, William Thomson (Baron Kelvin of Largs) in the ninth edition, Bertrand Russell in the tenth, or Niels Bohr, Marie Curie, Albert Einstein, Henry Ford, Harry Houdini, Stephen Leacock, and Leon Trotsky in the thirteenth edition. Halfway through its history, women began to be considered named contributors of the encyclopedia (they had been anonymous before that). Finally, Wikipedia takes a new approach to the volunteer and anonymous author as anyone can contribute to the encyclopedia. 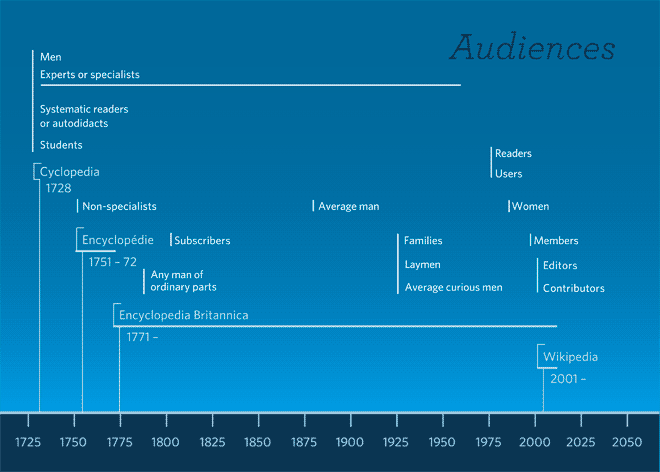 Like the authors, the imagined audiences of encyclopedias has changed over time. What seems consistent amongst all is the idea is that students or people who want to learn for themselves (autodidacts) are a major portion of encyclopedic readership. This has not really changed over time. As well, the idea of the average or everyday man (and only very recently average woman) as an ideal reader is persistent. However, there was once the conception that an encyclopedia would also be used by experts and specialists to keep up to date on the latest developments in their field. This was held up until the 1980s when the preface of the Britannica stated that it was questionable whether the encyclopedia had ever been used for this purpose. With Wikipedia there has been a shift toward blurring the difference between reader and author. In this sense, the audience is also considered to be valuable contributors. What is interesting about Wikipedia, is that while it continues to be useful for students, according to alexa.org, it is significantly more valuable to graduate students. Figure 4: Audience Demographic information from alexa.org, collected May 22, 2014. To read a full account of these changes over time you can read Chapter 9, Social contexts of encyclopedism of my masters thesis Wikipedia and Encyclopaedism.